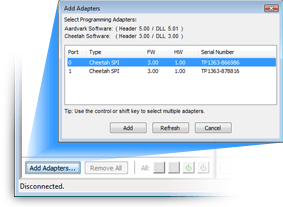 Launch the Flash Center Software and click the "Add Adapters..." button to open a dialog window displaying available Total Phase adapters. 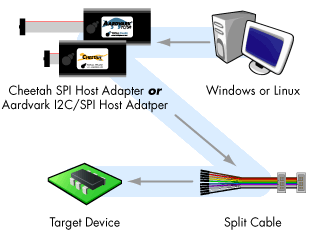 Select an adapter from the list to program the target device. It is also possible to gang program multiple memory chips of the same type by connecting more than one adapter at the same time. The Flash Center software can program multiple memory chips in parallel using the same data. The Flash Center application features an extensive library of part files for most major Flash and EEPROM memory vendors such as: Atmel, Microchip, Spansion, STMicro, and many more. Don't see your part number listed? No problem. The extensible XML-based parts library in the Flash Center software makes it easy to add new parts or modify existing parts. 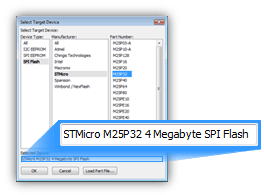 Load data from industry-standard data files, like Intel Hex and Motorola S-Record, or enter custom data to program into the device using the full-featured hex editor. 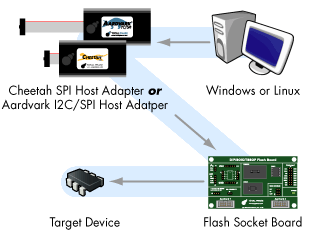 With a click of a button on the Flash Center software toolbar, engineers can quickly erase, program, and verify I2C- and SPI-based Flash and EEPROM memory chips.